Hemlock Street in Rancho Cucamonga is an ordinary street lined with nice tract houses. It runs through a typical neighborhood of green lawns, cars in the driveways, even a basketball hoop in one yard. But wedged behind those houses on the north side of the street is a brick house built for John Rains and his wife Maria Merced in 1860, a bit of California history. We’re here in Rancho Cucamonga today to tour the house and find out more about this historic spot. The day is warm and clear, and the nearby San Gabriel Mountains stand out in all their glory. By 10 am the tour guide walks across the extensive parking lot and slides open a large gate, opening the facilities for the day. We drive our car in and park. As we walk toward the house, I notice that there is a small vineyard set up on the house’s south side. Unfortunately, most of the plants seem dead, with only a very few of them sprouting green leaves, a far cry from the lush vineyards which once covered many acres of the property. The tour guide, a soft-spoken woman, leads us into the house while giving us a history of the house and the area. 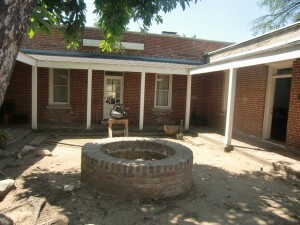 Once, the entire area, the Cucamonga Rancho, belonged to the San Gabriel Mission who stole it from the local Indians .It was used primarily to run cattle. In 1839 the Mexican governor of California granted the 13,000 acre rancho to Tiburcio Tapia and family who in turn sold it to John Rains, a prominent business man and socialite, and his wife in 1858. At first he used the land to graze cattle, but then decided to create extensive vineyards. In 1862 John Rains was murdered as he was on his way to Los Angeles by horseback. His wife, Maria, gradually had to sell off parts of the land, then lost it all in the 1870s. We first enter the living room. The thick walls and the ceiling here and all through the house are fresh white. The color makes the rooms neat and refreshing as well as giving us a cool feeling. The house is furnished with furniture and other objects of the period when Rains and his wife lived in it. Settees and matching chairs make the living room looked lived in. A mantel tops the fireplace and a brass chandelier hangs from the ceiling. A large rug covers most of the floor. Next, we file into one of the bedrooms where a bed takes up most of the space. The mattress lies upon rope webbing that can be adjusted. It is most comfortable when the webbing is drawn tight. This gives us the expression “sleep tight.” Also in the room were a pedal operated sewing machine like my grandmother used to have and photographs of John Rains and his wife. Rains was quite handsome. Most interesting of all was the dazzling white kitchen with its wood stove. All around were pots and pans, mixing bowls and tea kettles. The only thing it lacked was the tantalizing smell of cooking food. From the kitchen we stepped out into the central, sun-drenched patio, a round brick well at its center. A large tree partially shaded one corner of it. We enjoyed the sun and the fresh air, much as John Rains did in his day. The house had remained idle and uncared for for many years. A decision was made to bulldoze it and clear the property. The bulldozer had slammed into one wall, the bricks tumbling, when an elementary teacher who was interested in history saw what was happening. She had her class stand on the large machine and begged the operator to stop. He ceased what he was doing and through negotiations with the city the house was saved. We could still see where the new bricks were laid to repair it. I’m glad that such an historical treasure was preserved. My favorite place is the long, shaded porch facing south. I could stand on the porch, imagine the suburban houses to be gone and look out on a vast green sweep of vineyards. 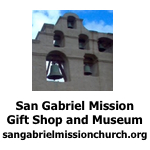 At one time the eastern San Gabriel Valley was the state’s prime wine producing area. Most of those vineyards are long gone, but the neglected remains of them can still be seen along I-15 and I-10 in the Cucamonga area. The tradition is maintained through several wineries and tasting rooms in the area. 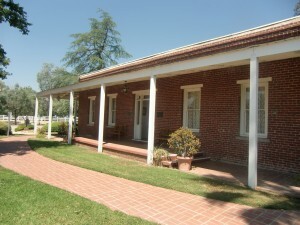 The John Rains House is on the Register of Historic Places and is open Tuesday through Saturday from 10:00 am to 3:00 pm. 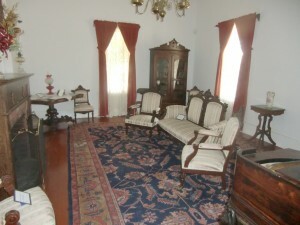 The living room of the John Rains House has furniture of the period. 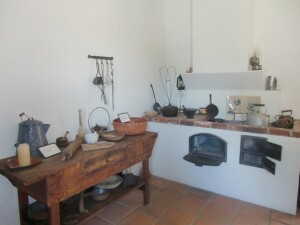 The old-fashioned kitchen was of particular interest. The pleasant patio is partially shaded. The long, shaded porch was my favorite area. I could look out and imagine acres of vineyards as far as I could see.